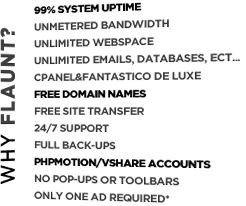 Flaunt Network is a Webhosting Provider under the Digital Millennium Copyright Act, 17 U.S.C. Section 512 (“DMCA”). Flaunt Network does not control the content of hosted fansites, but respects the legitimate rights of copyrights owners. In case of copyright infringement claims, Flaunt Network shall act in good faith upon notification by a copyright holder or their agent, to remove any infringing content from hosted fansites. E. A physical, electronic or digital signature, in a form acceptable to Flaunt Network, of a person authorized to act on behalf of the owner of an exclusive right that is allegedly infringed. Failure to submit copyright infringement notification as described herein will result in no legal notice or action on behalf of Flaunt Network. 2. that material was removed or disabled by misidentification, shall be liable for any damages, including costs and attorney’s fees, incurred by the alleged infringer. Flaunt Network reserves the right to terminate the user’s account in the case of repeat infringements of copyrights.